Jesus is the good king who came to serve, who showed his love by serving us to the point of death on a cross (phil 2:6-11). It’s through Jesus service that the lie of Satan (the lie that said God doesn’t love us) is dispelled when we see that God loves us and will do anything to provide for us the very best of life and life to the full in his kingdom. If Jesus is the Good King who came to serve, and if you are baptized into his name, you are his servants sent into the world to display the truth of God’s love through your actions–to show the world that God loves them through YOUR actions. So how can you sere in the snow storm? Check up on the elderly and the infirm. See if they need anything and then provide what they need. Offer to drive to get their groceries or medicine if needed. The roads might be driveable but many won’t want to take a chance or might be to unstable to walk in the snow or ice. 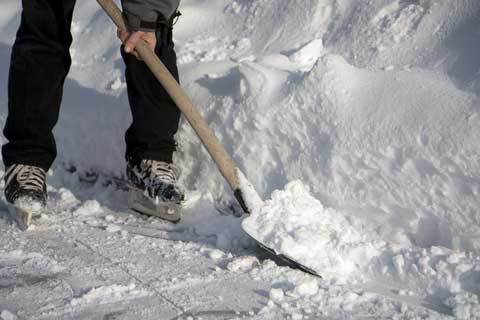 Shovel, snow blow, or plow your neighbor’s walk or drive way…even if they could do it themselves. Make a large pot of soup and bring some containers for the neighbors around you. Share some of the milk, eggs, and bread you started hoarding the moment you heard we were going to get snow. (Sorry, couldn’t resist). If you’ve got a good vehicle and confidence in your driving, offer to pick up a coworker or take them home if the roads are bad. Finally, Ask the Spirit who you can serve and what you can do for them. Use this as an opportunity to build relationships with neighbors you haven’t seen all winter or haven’t met yet. A while Back Seth McBee, of Soma Communities and the GCM Collective, wrote an article entitled, “A Story of a Gospel Community.” Read how God used him to start a missional community, engage many neighbors, reach some for Christ, and send them out as disciples. “In two weeks, in a suburban town outside of Seattle, we’ll celebrate God’s grace and the Spirit’s work through baptizing a new disciple of Jesus. This is the story of how a neighborhood can look like the book of Acts, where disciples are made and we teach and preach from house-to-house, an example of how to make disciples in our sphere of influence… in today’s context. None of our current Missional Communities are in “At risk” neighborhoods. While MC West is maybe interacting with people in poverty as they meet in Jackson Park, neither of our initial MCs are really in neighborhoods of poverty. Yet I think that the message in this video can teach us something about community that is pertinent to our mission to bless and the greater community in which we meet and live. The video said, “People are the foundation on which a strong neighborhood is build.” Do you know the people in your neighborhood? If not, how can you take a step to get to know more of your neighbors? How are you investing in the people of your neighborhoods? Is there anyone else in your neighborhood already engaged in helping their neighbors and fostering community? If so, how can you partner with them? Check out Incommon on their work of building Community to lift areas out of poverty. I found the video on Communities First Association’s blog. Sometimes a commercial, song, or film can really capture a great idea. Check out this Coke add below. What kind of community or gathering does the video depict? Is it small or large? Is it inclusive or exclusive? How does the community from the commercial reflect the yearning of the human heart? How close is it to the community of the church? How effective would the Christian message be if Christians blessed their neighbors and acquaintances with such a community? How often do you gather with the people who you know? Have you held a “Bridging Event,” a community building party for the express purpose of getting to know the friends and acquaintances of your friends? How can you create this community? Consider working with a few friends or neighbors to throw a party. Have each person invite people they know well and not so well. Ask those people to invite a friend as well. Again, focus on getting to know people and connecting others. In either case, You’ll be bringing the better wine. You’ll be blessing those around you. This might establish or strengthen relationships. It might prepare the way for later chances to share the gospel. For my Core Group, for next time read the Gospel-Centred Life Chapter 9, Decisions. How many of your neighbors do you know? What can you do to learn more about your neighbors? How can you build up your neighborhood to show the love of Christ? Ask a neighbor from your community to help you organize a block party. Involve some other Christians from the neighborhood, your missional community, Small Group, or church. Don’t bait and switch. Don’t invite people to a BBQ and then hold a revival. Rather, take the time to show interest in others, learn their stories, and deepen relationships. Later opportunities might provide for a Gospel witness. Here’s a great Neighborhood block party kit which will help you think through every aspect of planning a block party.